More info about the specs of the upcoming Nokia cameraphone flagship, dubbed EOS, have surfaced. The device is set to carry the torch for the 808 PureView in the Windows Phone 8 era. A report by MyNokiaBlog citing a source inside Nokia suggests the Finns are currently testing out two different versions of the EOS - with dual-core and a quad-core chipsets, respectively. In fact, the quad-core one is none other than Qualcomm's Snapdragon 800, but is said to be ditched in favor of the dual-core alternative due to unsatisfactory battery performance. Speaking of battery, the source of the rumors has mentioned that the Nokia EOS would feature a 2000mAh unit - the same size as the one in the Lumia 920. However, the gist of the report is the camera itself. It is rumored to sport a sensor similar to the 41MP unit of the 808 PureView, optical image stabilization and variable aperture lens. Naturally, the sensor itself will be updated as will be the camera interface. Xenon and LED flash units will both be present and there are tests with 2K or 4K video recording, although it seems unlikely to make it to the final product. 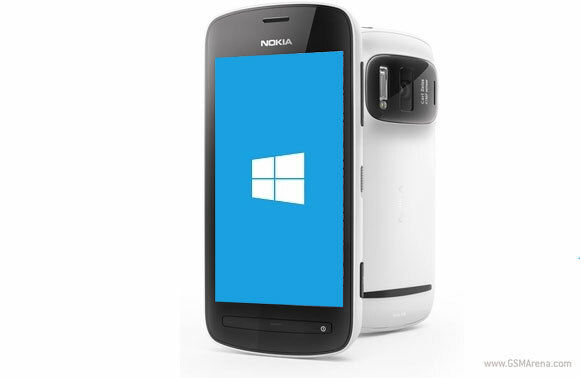 The Nokia EOS would feature a display of the AMOLED variety with the same resolution as the Lumia 920 (1280 x 768 pixels). Display size remains unknown at this point, though. FM radio, microSD card slot and micro HDMI out port are also rumored to be part of the Nokia EOS arsenal. As far as its launch date goes, nothing is set in stone, but there's information the EOS might be exclusively released for AT&T. International launch would follow 1-3 months later. I don't think it0s going to be SLR, that thing is huge, and it needs mirrors and everything. It may have CMOS sensor, but no way it will be proper SLR.